FIFA-appointed Normalization Committee has lent a hand to organisers of the John Agyekum Kufuor (JAK) Cup scheduled for Sunday, in honour of the ex-president. A release signed by the NC president, Dr Kofi Amoah, said that the Normalization Committee will support the organization of the JAK Cup with ¢25,000. Also, it said the NC will provide some logistics for the match between Asante Kotoko and AshGold at the Baba Yara Stadium, tomorrow. The JAK Cup match, is one of the lined-up activities expected to raise ¢80 million to cater for the various developments and leadership projects under the JAK Foundation. Dr. Kofi Amoah said the NC gesture is a token of their appreciation for J. 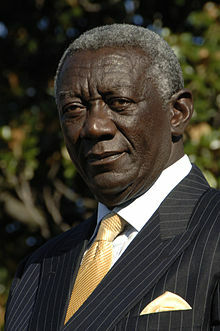 A. Kufuor’s achievements that transcended sports during his tenure as President of Ghana. He said the committee believed in the ideals of the former president in ensuring the country in general and sports in particular, thrived under his watch. The match will be graced by H.E. John Kufuor, the Asantehene Otumfuo Osei Tutu II and other dignitaries. The former president, John Agyekum Kufuor, turned 80 on December 8, 2018, and the match forms part of activities marking his 80th birthday celebrations. As a former chairman of Kumasi Asante Kotoko, President Kuffour’s contribution to Ghana football cannot be overemphasized. Among other things, President Kuffour outdoored Ghana’s brand of football to the expectant global audience in 2006 after Cameroun icon, Roger Milla, had heralded at the Italia 1990 World Cup, the potent force of Ghana Football. President Kuffour instilled pride and honour in players for representing the nation and rewarded them with a handsome winning bonus system. He made funds available for the polishing up of the Black Stars, which he equipped with a football psychologist and a nutritionist, a first in the history of the team. The Kumasi and Accra stadia were donated by foreign companies. He did not only build the brand new Tamale and Essippong stadia, he also completely refurbished the dilapidated Kumasi and Accra stadia into modern edifices. JAK’s contribution to Ghana football crosses the physical, spiritual and emotional realms; he oversaw the hosting of the best ever African Cup of Nations Football Tournament in 2008, per CAF’s judgement. “The GFA appreciates and adores the significant and foundational architecture JAK laid for Ghana (football) and we join the organizers of the J A Kufuor Cup in saluting him for these achievements for our nation,” it concluded.